Any Blu-Ray Copy is a powerful but easy-to-use Blu-Ray Ripper and Converter for users to make complete copies of DVD and Blu-ray movies, which can rip any BD/DVD movies to MP4, AVI, MPEG, FlV, 3GP and even HD videos for iPod, iPhone, iPad, PSP/PS3, Motorola Xoom, Google Nexus One, HTC series and other cell phones with loseless quality and amazing speed. 3. Combined with video converterAny Blu-Ray Copy also supports converting video files to other formats including HD MP4, AVI, MPG, TS videos or MP3, AAC audio formats. 4. Support various media players and phonesiPod, iPhone, iPad or PSP, Zune, iRiver, Archos, Motorola Xoom, Google Nexus One, HTC, Nokia videos are supported. 5. 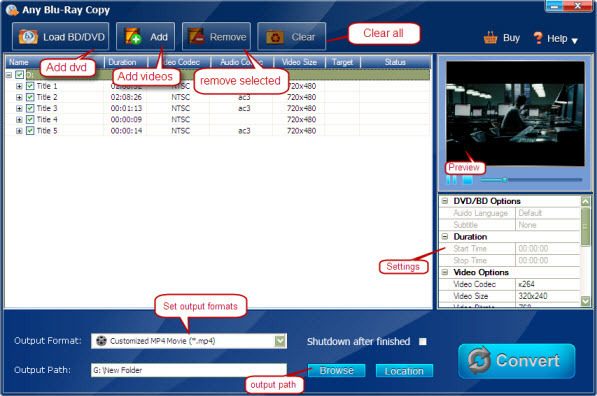 Customize output video&audio parametersYou are allowed to customize the output parameters including codec, resolution, bitrate etc for output video and audios. 6. Copy full BD movies to BD discs. Qweas is providing links to Any Blu-Ray Copy 2.0.0 as a courtesy, and makes no representations regarding Any Blu-Ray Copy or any other applications or any information related thereto. Any questions, complaints or claims regarding this application Any Blu-Ray Copy 2.0.0 must be directed to the appropriate software vendor. You may click the publisher link of Any Blu-Ray Copy on the top of this page to get more details about the vendor.